Lackawanna Railroad GP7 959 (EL 1278, Conrail GP7 5993, Conrail GP8 5460) is on its way to Scranton. A project of the Tri-State Chapter NRHS working with the Delaware-Lackawanna Railroad, this was a complicated effort that required some time and a lot of hard work by the Delaware Lackawanna principles, employees and contractors. 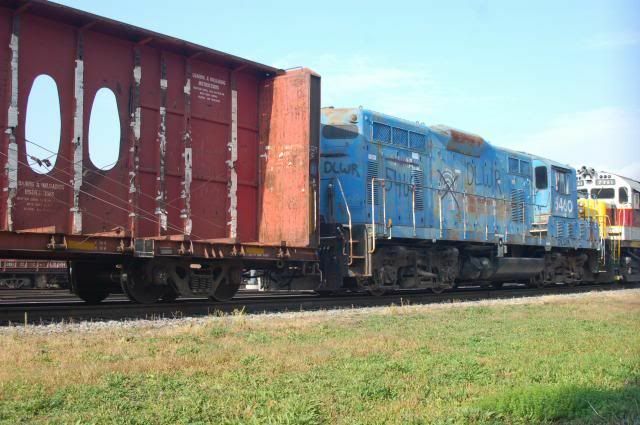 Traveling as DLWR 5460, it left Kankakee on Monday, 9/17, and has been making its way east. Today it was in Conway, Pa., and it should be heading to Allentown tonight. NS delivers to the DL at Portland, Pa., on Tue-Thu-Sat. We'll share more details as they become available, and the full story will one day be told. For now we wanted to let everyone know that this significant locomotive has been saved. Once in Scranton it'll be evaluated and a restoration plan developed. Certainly it'll see use on home rails in the Scranton area, and it will be made available to Steamtown National Historic Site when it needs diesels and for special occasions. Built by EMD in April 1952, the 959 was among 15 dynamic-brake-equipped GP7s (951-965) that pulled freight alongside steam power on the Road of Anthracite until the last fires were dropped in Scranton during the summer of 1953. After the Erie merger in 1960, the 959 was quickly renumbered 1278. It became Conrail GP7 5993, later rebuilt by Morrison-Knudson as GP8 5460. Conrail traded it in on new power in 1991, which landed it in the Pielet Brothers scrap yard. A fortunate set of circumstances resulted in the locomotive being set aside, and that led to it becoming the Pielet Brothers shop switcher. Around 2001 the 5460 was sold to Vulcan Materials (Lehigh Stone) in Kankakee, making it only the second locomotive to leave the Pielet Brothers scrap yard in running condition. There will be many acknowledgements as the project moves along and the image of a Lackawanna GP7 emerges. But we are grateful to to the people at the Delaware-Lackawanna, Norfolk Southern and Vulcan Materials, for bringing this worthy project to Scranton. For now, if anyone has pictures of this unit in service in any era or en route to Scranton, please post them for all to see, especially those involved in the restoration. This unit wore three EL paint variations; DL&W black with EL number, EL black, and EL stripes. It makes so much more sense now, knowing that Tri-State was a part of this. For the life of me, I couldn't fathom why a GVT railroad was getting an EMD locomotive hahah. Awesome news all around, can't wait to see it up and running in the future. Kudos to everyone involved in this project. This is a good example to those who have been skeptical of internal combustion preservation. "What's the value in restoring/preserving yet ANOTHER GP7"? "It's the last one of it's kind from a fallen flag railroad with precious few preserved locomotives of any make or model". If D-L is involved, you know it will be done first class. There's also something to be said in favor of preserving a "plain vanilla" loco. Look how many UP Centennials were preserved, a strange model unique to one order from one railroad. Way out of proportion to its importance in the overall development of diesel locos and how they displaced steam. Mr Hamley is right on. There are way more 44 and 45-tonners and SW-somethings and S-series Alco switchers preserved relative to their place in the railway pantheon. 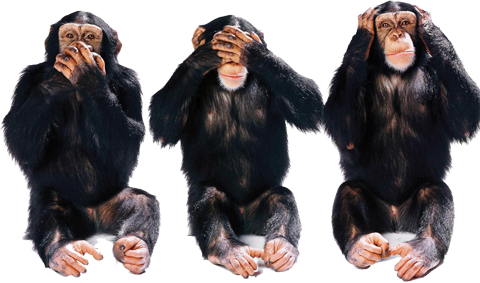 We should have been saving stock Geeps and Baldwins and FM's. They are the locomotives that made the transition from steam to diesel possible. And I say that as a die-hard steam guy. You hit the nail on the head! We have a small museum, with a limited collection. But one thing that I would really like to have is a first generation cab unit or road-switcher so we could use it to try to explain to visitors, what type of diesel replaced our Kanawha in regular service. If we ever are lucky enough to get an example, it would finalize our diesel locomotive collection. BTW, I enquired of DL&W 959 when I found out she was in Lehigh but Vulcan advised me that she was spoken for. Glad that she was saved and is going to a great home. Any fan of the anthracite roads has to smile about this unit being at Vulcan and Lehigh... Indiana. It has been a long road, made possible by many facets of DL&W fans working together. Congrats to all who saved her! To keep the record straight, the Lehigh quarry mentioned is in Illinois, not Indiana. Spotted this morning(?) on NS train 10G in Altoona, photo via Facebook. I'm guessing someone on the repatriation staff isn't a Conrail fan. 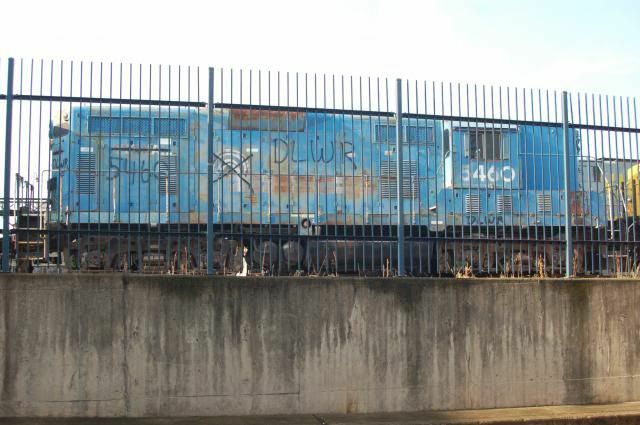 She's seen better days, but I've seen locos in far worse shape (CNW 4160) end up running at museums. She was operational as of a year ago when the quarry she was at got their replacement. Overall, she looks a lot worse than she is. 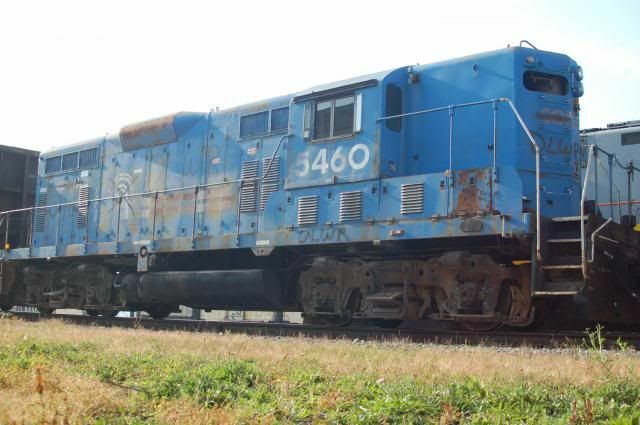 Here are some photos of 5460, still in Conrail paint after 32 years away from Big Blue. These were taken in Scranton on Sunday, October 6. We saw pictures today of the inside of the cab, and this engine is a time machine. It has the 24RL brakes and the big drum controller and gauges just as it had when delivered. What a gem, and a great specimen for preservation. The 959 was near the roundhouse today, and it'll move to South Scranton where the mechanics can give it a looksee as they prioritize it among work on the Big Alcos. I've suggested to a few fans that when they get next to the future Lackawanna 959, they give the frame number a kiss. It was those frame numbers that saved this engine. After requests to Conrail to make a DL&W and Erie GP8 available for URHS in New Jersey didn't succeed, Conrail traded the GP8s in on new power in 1991. They were shipped to Pielet Brothers where the long-standing contract requires that anything that goes in must only leave as scrap. Jack Wheelihan and the late Glenn Monhart were service managers at EMD at the time and they knew the foremen at Pielets. Knowing these Conrail GP8s (two DL&W's and two Erie's) had to be cut, I told Jack that his boyhood engines were across the street from his office, asking him if there's something that can be cut or saved from these engines as a momento. After visiting them with Glenn, Jack had the idea of asking if Pielet could cut out the frame numbers of one of the DL&W units as a keepsake; one each for Jack and I, and we were going to pay the cutters for their time. Pielets agreed, so the 5460 was set aside. Many months go by, and the 5460 gets deeper and deeper as new-arriving stuff was onto that track ahead of the 5460. One day Pielet's little switcher has a fatal failure. The 5460 was a running engine, so Pielet began using it. I took a picture of 5460 in service at Pielet Brothers during the 1999 EMD Open House. Pielet's gets sold, EMD is evolving and getting smaller, and the agreement is perhaps forgotten. The quarries surrounding EMD's LaGrange plant are operated by Vulcan Materials, which may have influenced the sale of 5460 to them a couple of years later. This trip east for 5460 was more than two years in the making. Lackawanna 959 is just the second locomotive to ever leave Pielet's plant in LaGrange in operating condition, the Burlington E5 at IRM being the other. That one required letters from the president of the Burlington Northern and EMD to authorize its release. There are many thank yous to go around, and we'll tell the whole story eventually. This was a great cooperative effort of the three corporations (DL-parent Genesee Valley Transportation, NS and Vulcan) and the Tri-State Chapter NRHS in New Jersey, each playing its part. The DL team worked over and above the call in many regards, and deserve a special place as curators of history in addition to running a successful business. DL also preserved EMC's "prototype freight locomotive" from 1935, Lackawanna 426, a six-hundred horsepower, cast frame switcher currently on display in the roundhouse "core complex" at Steamtown. Vulcan retired it more than a year ago, ahead of its plans, to make it available for preservation by a plant manager with an interest in history. Stay tuned as we announce the plans to paint it, after the DL mechanics weigh in.